So, I’m going to skip the background and the stories and get right to the recipes. Then, I’m going to close my computer, load Mary Poppins into the Blu-Ray player, and spend the rest of my day singing about chimneys and spoonfuls of sugar. Today’s meal consists of a fast broiled skirt steak served over smashed red potatoes, loaded with cheddar and horseradish. 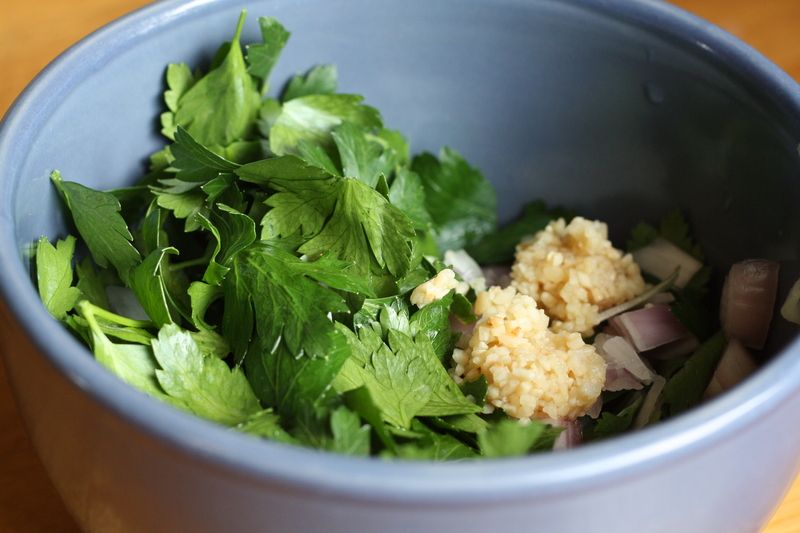 Topping it off is a vibrant chimichurri sauce, oozing with the flavors of fresh parsley and garlic. It’s a supercalifragilisticexpialidocious kind of meal! Preheat broiler. Trim any excess fat from the exterior of the steak. Season with salt and pepper. Place the steak on a baking sheet. Cook several inches under the broiler for about 10-15 minutes, to your desired doneness. Allow the steak to rest for 5 minutes before slicing. Slice diagonally against the grain. Combine parsley, garlic, shallot and white wine vinegar in a food processor, blender, or immersion blender, until well blended. Gradually drizzle in the olive oil until a sauce forms. Season with salt and crushed red pepper, as desired. Place the potatoes in a large pot and fill with enough water until the potatoes are just covered. Bring to a boil, then cook for about 10 minutes, until the potatoes are fork tender. Strain. Add the butter to the hot potatoes and smash to your desired consistency. Add the milk, cheese, and horseradish. Stir until combined. Add additional milk, if necessary. Season with salt and pepper. Posted in Beef, Cheese, Dressings and Condiments, Food, Main Course, Recipes, Sauces, Side Dishes and tagged beef, cheese, comfort food, Cooking, easy dinner, food photography, potatoes, Recipes, sauce, steak. Bookmark the permalink. I love the idea of your Chimichurri Sauce. 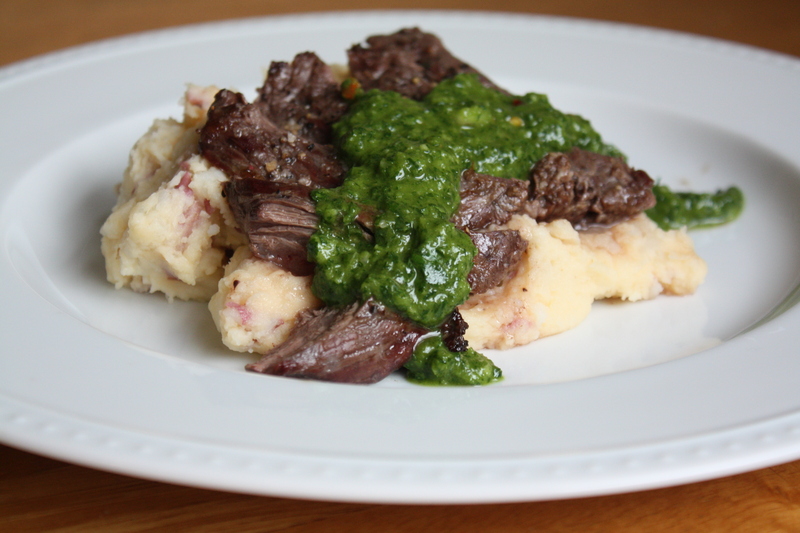 Im in love with steak, have never had chimichurri sauce – but I have GOT to try these smashed potatoes!!! They sound awesome. 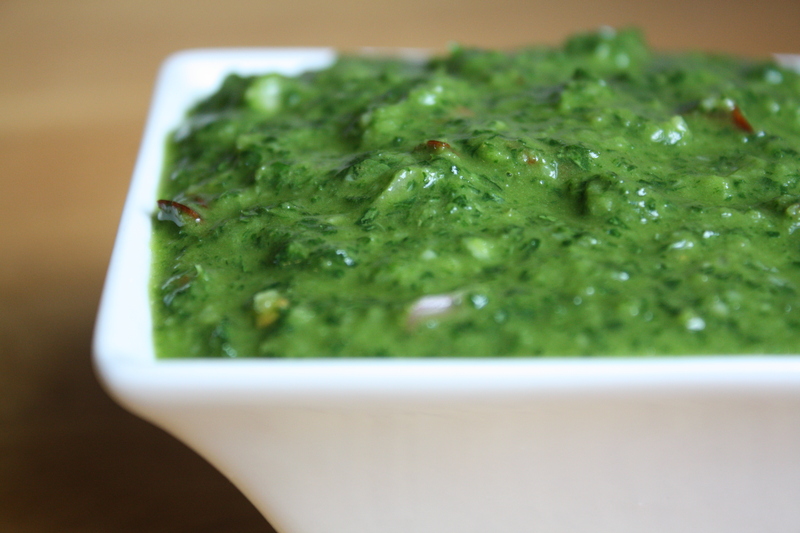 Mmm I LOVE Chimichurri sauce – can’t wait to try your recipe!